Shopping and the beach? Our two favorite things! 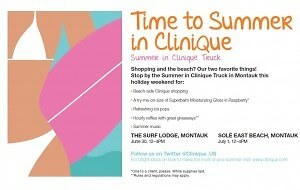 Stop by the Summer in Clinique Truck at the Surf Lodge and Sole East in Montauk this holiday weekend. *One to a client, please. While supplies last. **Rules and regulations may apply.